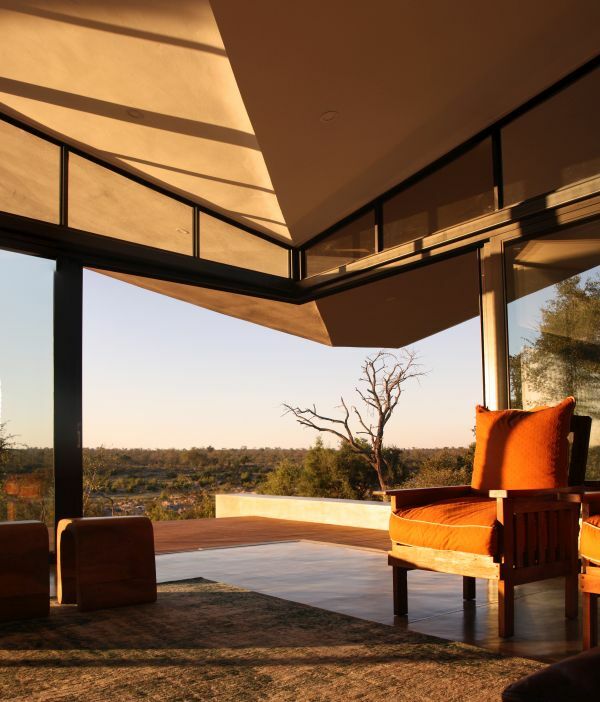 “When asked by WALLS & ROOFS to select our top project of the past year, despite the vast number of inspiring buildings from across the world which have been built in the last twelve months, we kept on coming back to a project we were involved in, a lodge at the Mjejane Private Game Reserve,” says Mike Rassmann, one of the three partners at the Johannesburg-based practice, Architects Of Justice. “Besides, it’s holiday time! Who wants to read about an office building this time of the year?” he laughs. Rassmann notes that the 450m² holiday home is a great example of fairly extravagant architecture, which, with the current economic climate, is a rarity these days. “Recently we have seen that a lot of architecture is practical and pragmatic, while the lodge at Mjejane is a bit extravagant, a bit over the top,” he explains. The architects have created a structure which rests elegantly in the surroundings. 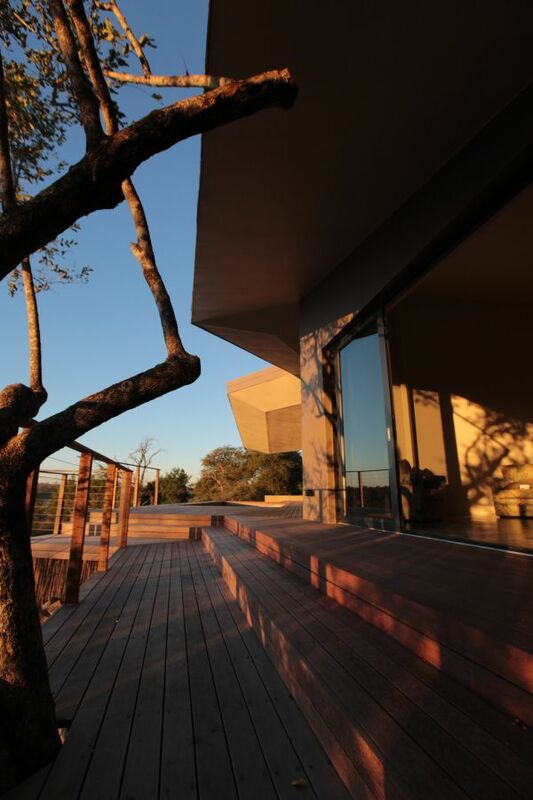 Situated within the Mjejane Private Game Reserve, the retreat was designed to maximise the connection to nature while ensuring privacy between the five en-suite bedrooms and neighbouring lodges. In the interior, huge glass windows, doors and fin walls constantly connect and direct the user to the outside bush and facilitate a constant flood of light on the hand-polished concrete floors and simple plaster walls, while angled ceilings facilitate natural airflows. At its maximum, the roof overhang extends in an impressive 13m butterfly cantilever creating a seemingly unsupported roof over a boma. Designed around the existing flora on the site, nature however provided unique challenges; there could be no openings or entries into the roof void, as it would provide the ideal habitat for a myriad of animals to take up residence within this space, and measures had to be taken to prevent warthogs residing underneath the suspended wooden deck. The crowning jewel of the house is a floating steel roof that overhangs the house on every side with a minimum overhang of 1,6m. 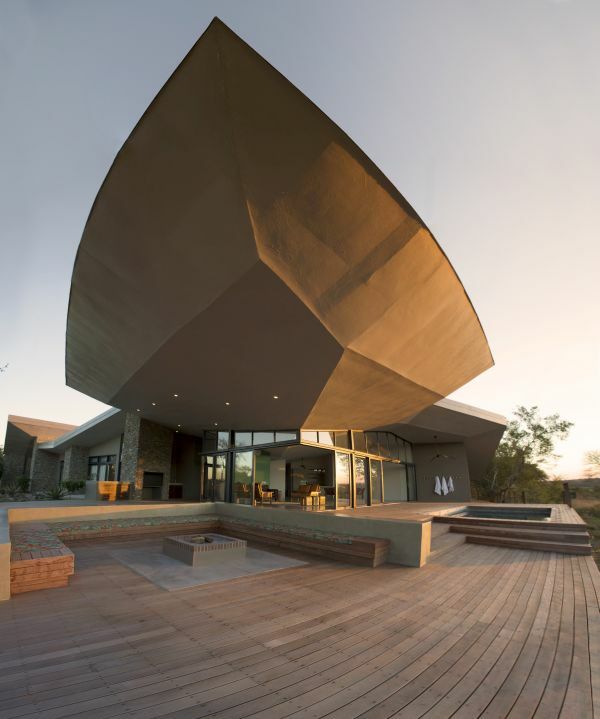 At its maximum, the roof overhang extends in an impressive 13m butterfly cantilever creating a seemingly unsupported roof over a boma. The total roof area for the residence is a remarkable 900m², allowing inside spaces to blend effortlessly with the outside. 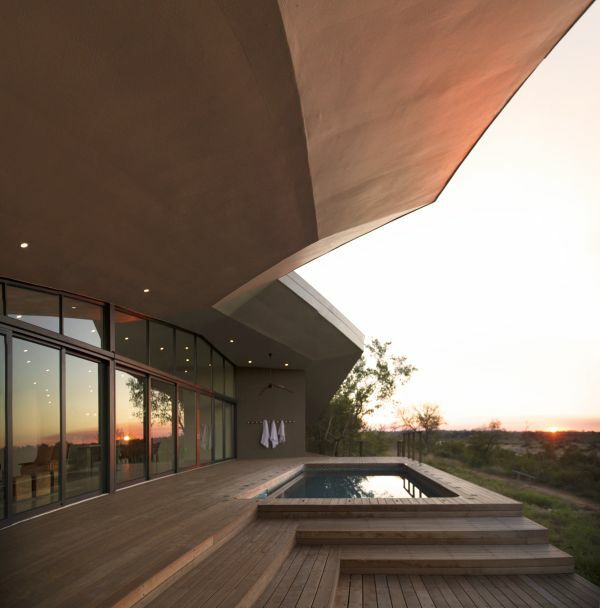 The overhangs helped to design a passively cooled home, which mitigates heat gain by shading the exteriors throughout the day in an area of the country that often reaches 30°C in winter and well over 40°C in summer, while also facilitating rainwater harvesting. Off-site fabrication allowed for a very clean assembly process on site, and bolted connections meant that very little welding took place on site. A four-phase Lego-set type erection also meant that there was no need to clear and disturb the natural bushveld for the storage of building materials. The placement of the windows facilitates a constant flood of light into the interior. “It really is a project which is out there to make an architectural statement of form and place, which doesn’t say that the building doesn’t work functionally, but it really is a very impressive building. It is becoming rarer to find these kinds of projects where you can be so expressive, because clients are becoming very budget conscious. We didn’t waste money, however, and it was a project we were fortunate to work on,” says Rassmann. Ultimately, Architects Of Justice created a structure which rests elegantly in the surroundings. It is a home which, while being architecturally innovative, doesn’t distract from the location of the project and draws the user’s attention to the outside. “The project was the client’s dream, a place to escape to after many years of hard work, and we, as a practice, were happy to oblige,” Rassmann says. Caption main image: Mjejane Lodge is a place of escape, where one can connect with nature.